Discover the beautiful side of this fashionable and exciting international hot spot. 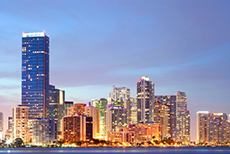 Some highlights include the many mansions of Miami, Little Havana and Calle Ocho, South Beach Art Deco district, Coconut Grove, Brickell Avenue, and Coral Gables. I want to give the tour company more stars but NCL mislead us and had limited info on the tour. I want to give the tour company more stars but NCL mislead us and had limited info on the tour. We had a 3:30 departure at FLL and the tour didn&apos;t allow much time to "hop on or hop off" in Miami. It was a good way to see Miami. It was a good way to see Miami. Comfortable, air-conditioned bus ride. RCI offers a shuttle to the Bayside Marketplace. RCI offers a shuttle to the Bayside Marketplace. It takes us 15 min from the moment we got off the bus to be back at the bus stop waiting for the next bus back to the cruise. A great way of seeing the city. We took the bus tour that has stands right off the ship. Top 10 of Miami - very interesting. Top 10 of Miami - very interesting. Enjoyed it! Great guide and loved seeing South Beach and Little Havana. We really enjoyed and we had time to lose before taking our flight. We really enjoyed and we had time to lose before taking our flight. Good way to spend time without the hassle of carrying your luggage. Mostly spent time riding in the bus which, thankfully, was in good condition. Mostly spent time riding in the bus which, thankfully, was in good condition. Stops were unrewarding for amount of time and $$. Typical hop-on, hop-off bus loop. We booked the Miami bus tour. The combined Miami City and Boat tour was very nice conducted via double-decker bus. I went on a city tour in Grand Cayman and it was very funny and enlightening as to the history of the island. this was the hop off/hop on tour...the directions we received from the shore excursion desk and what we got in our rooms with paperwork were a little confusing for how to deal with our luggage but it all worked out. We did the Miami hop on hop off. We did the Miami hop on hop off. Both the red and blue loops. Tour was enhanced by the weather being perfect so we sat up top the bus the whole time. Great way to kill time before heading to the airport. Went on the ultimate city tour very good guide and had a Cuban lunch. Our last day and it included transport to Fort Lauderdale Airport. Our last day and it included transport to Fort Lauderdale Airport. Well organized and informative. Make sure to put sunblock and a hat in your carry-on bag that last night. It’s an open air bus up top. Interesting, if brief, tour of the city for not much more than the price of cab fare to the airport. The tour itself was nice and interesting. The tour itself was nice and interesting. The bus was a double decker with all the seating up top. No shade and it was hot and humid. We were sweating like crazy by the time we got to the airport. Ed on the Big Bus tour knew his city and its` history. Ed on the Big Bus tour knew his city and its` history. The tour bus was a double-decker (think London). Personal group tour of the island with food and drink samples from a variety of places. Personal group tour of the island with food and drink samples from a variety of places. Book independently, not through the cruise. Good value and well organised.Was collected and dropped back at hotel. Good value and well organised.Was collected and dropped back at hotel. Took open top tour bus of miami city. Would recommend.